Hip-hop fans, get excited!! 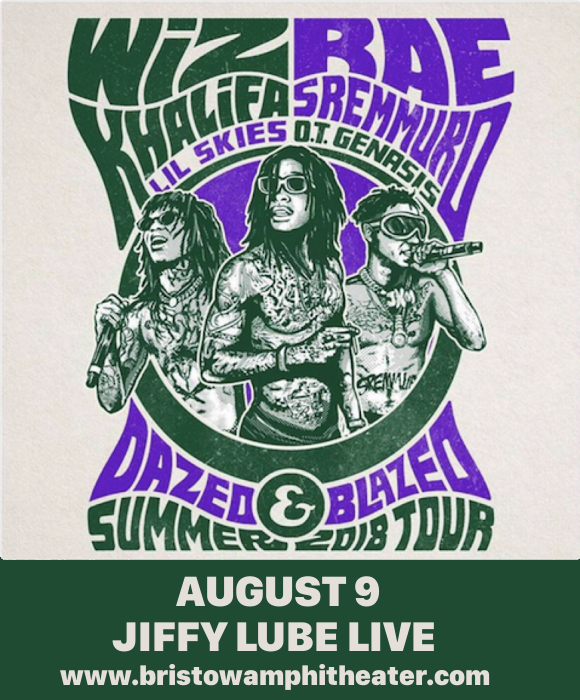 We’ve got a massive show coming up at Jiffy Lube Live on August 19th 2018 – none other than the massive rap acts Wiz Khalifa and Rae Sremmurd with support from Lil Skies and O.T Genasis!! No fan of any of these dope acts can afford to miss it – so don’t be left out! Get your tickets NOW while you have the chance!! A literal rags to riches story, Rae Stremmurd, comprised of brothers Slim Jxmmi and Swae Lee, saw their beginnings when the brothers, kicked out of their home, began squatting in an abandoned house and holding parties there to promote their music. Gaining local fame and the attention of a world-renowned producer, they released their debut album, “Sremmlife,” in 2015 and saw the record quickly earn Platinum certification from the RIAA. Now, they’re rolling in it and celebrating in style – their latest record is a 3-disc compilation including solo albums by both brothers!! As for Wiz Khalifa, he’s earned a steadily growing following since he first emerged on the rap scene with his album “Show and Prove,” in 2006. He gained massive recognition for his first single for the Atlantic label, “Black And Yellow,” which was used as an anthem for various Pittsburgh sports teams. His upcoming new album is due out in July!! Don’t wait about – those tickets aren’t going to!! Hit the “buy tickets,” button above and get your tickets to see Rae Sremmurd and Wiz Khalifa NOW!